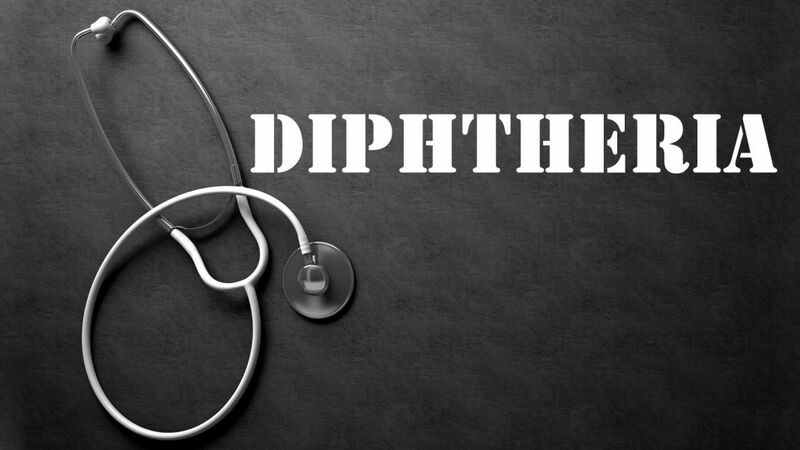 Diphtheria is a highly infectious disease, and sometimes it becomes epidemic. At the commencement there is fever, chill, vomiting, purging, prostration, restlessness, anxious looks, flushed face, sore-throat, swollen tonsils and foul breath. The disease, it is said, is caused by “Klebs-Loeffler’s Bacillus” which may gain access to the system by direct contagion or by means of something that is actual contact with some other case. There is formation of false membrane on the throat, which causes swallowing and breathing difficulty and if immediate step is not taken to check the progress, the patient ultimately dies of suffocation. Prophylactic—Diphtherinum 30; once during epidemic. Dr. H.C. Allen prescribes Diphtherinum in higher potencies all through the attack with success. He uses it also after allopathic treatment has been tried and if patient manifests paralytic symptoms. Dr. Clarke prescribes at first Diphtherinum 30— 200, every 2 hours, to be followed often by Merc. Cyanatus 6—30. A regular throat wash by Phytolacca, m 5, mixed with an ounce of water is also recommended. Lachesis 6—Where prostration is severe, heart’s action is feeble, outside pressure produces pain inside the throat; glands are affected; the membrane spreads from left to the right side. Aconite 3x or Belladonna 3x—If the throat is red and inflamed, face and eyes are injected, headache, pain in swallowing, pulse is hard and full, inflammation exists on soft palate, tonsils and wind pipe. Mercurius 3x—if the affected part is very sore, prostration is intense, pulse is quick from the start, glands are swollen, false membrane has already formed, palate and fauces are red, tongue is red or greyish coated, foetor in breath, difficulty in swallowing, profuse salivation. Acid Muriatic 3—is applicable to cases with grey sore inside throat, prostration, fator in breath. Kali Mur. 6—when a white membrane forms inside the throat and there is pain in throat. Echinacea Ɵ (dose, m.5—10)—is useful especially in gangrenous conditions. Arsenic 6—is used in the last stage of the disease, when pulse is weak and blood and pus exude from the sore in the throat. Pinapple-juice (fresh) freely used is said to benefit cases.